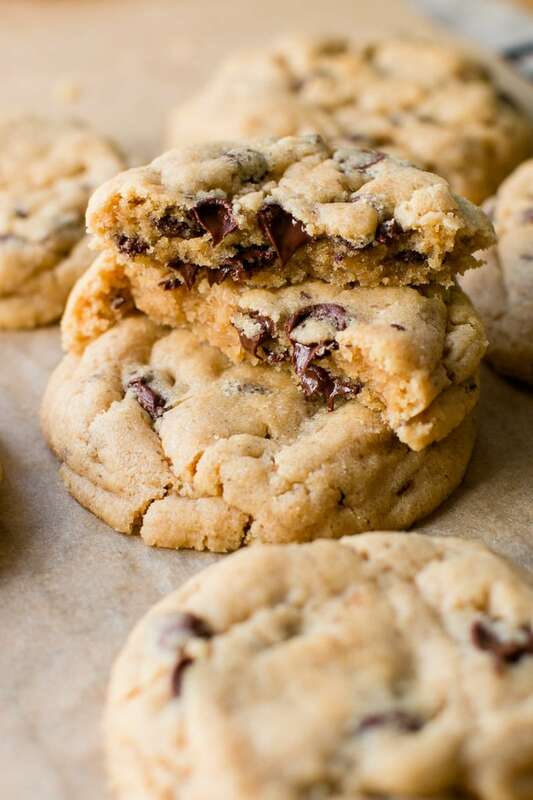 Amazing Peanut Butter Chocolate Chip Cookies - Pretty. Simple. Sweet. 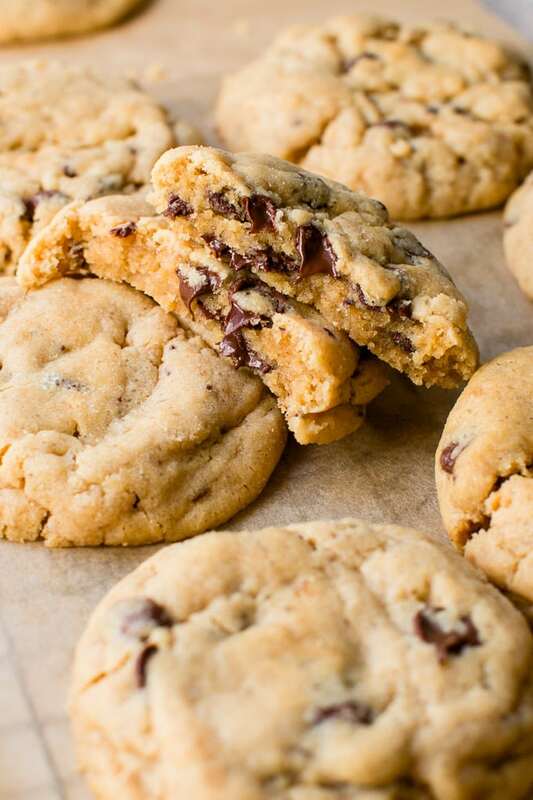 These soft bakery-style peanut butter chocolate chip cookies are packed with peanut butter flavor and loaded with chocolate chips. If you serve them warm, they will melt in your mouth! 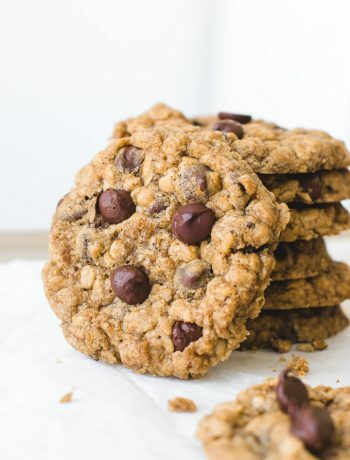 These easy peanut butter chocolate chip cookies are becoming my new favorite cookies because they combine two of my favorite things: soft chocolate chip cookies and salty peanut butter. A while ago, I posted a photo of chocolate chip cookies after deciding to throw peanut butter into the batter at the very last minute. This generated a lot of excitement as many of you have reached out and asked which recipe I used and how much peanut butter to add. So I started experimenting with different cookie recipes and different amount of peanut butter to share with you the best cookies possible. Use creamy peanut butter like Skippy. Chunky is ok if you want some peanut chunks in it. At first I added 1 cup of peanut butter to the cookies, which is what most recipes use, but the flavor wasn’t strong enough. 1 and 1/2 cups tasted much better, and the texture of the cookies was still good. You can even add some more peanut butter if you like, but the cookies will be more crumbly. I can’t stress this one enough! 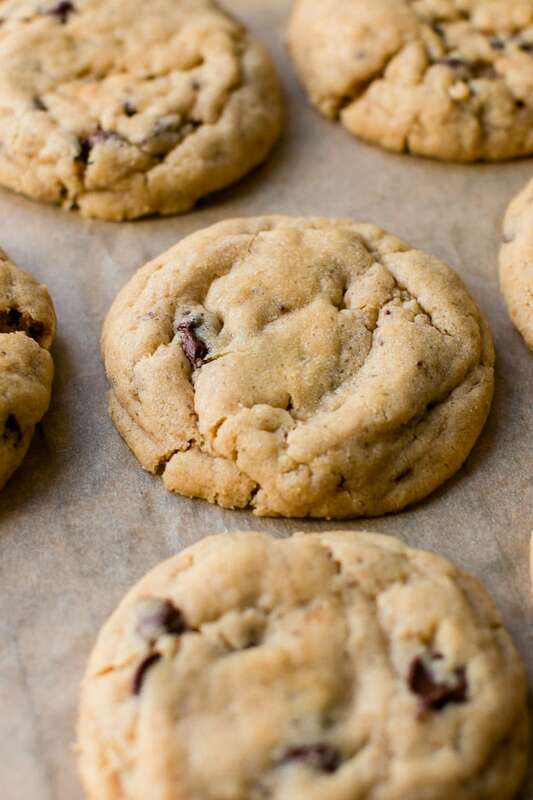 The baking time can affect the texture of the cookies greatly, and slightly underbaking cookies will make them softer and chewier. 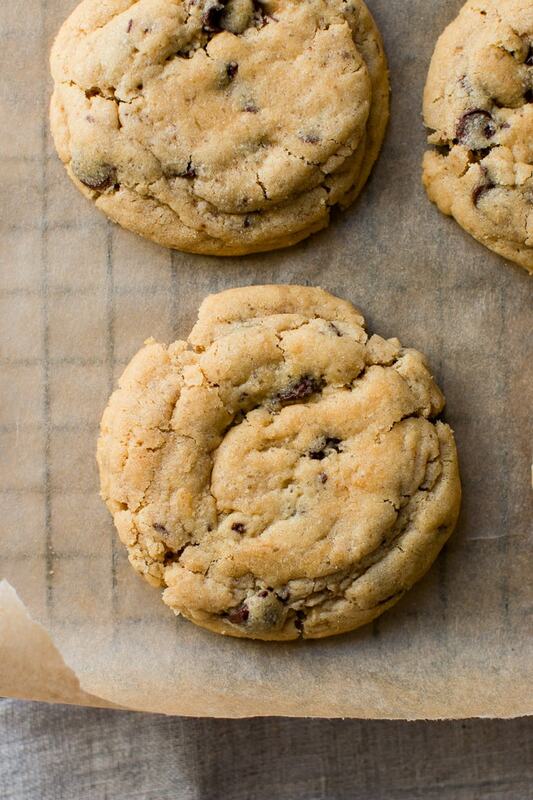 If you end up with a hard batch of cookies, bake the next batch for less time. Mine were ready in 10 minutes, but depending on your oven it can take up to 12 minutes. I take them out of the oven as soon as they turn golden brown around the edges. In a mixer bowl fitted with the paddle attachment, beat the butter and peanut butter on medium speed for 1 minute until creamy. Add brown sugar and granulated sugar and beat on medium speed for about 3 minutes, until fluffy. Beat in the egg, one at a time, then beat in vanilla extract. Add flour mixture and mix just until combined. Do not overmix. Add chocolate chips. The dough will be soft at this point. Chill it for about 1 hour until it's easy to handle. Preheat oven to 350°F/180°C degrees. Line 2-3 pans with parchment paper. Roll dough into balls, the size of 2 tablespoons each (mine were about 40 grams each), and place onto the cookie sheets. Bake for about 10 minutes, until cookies just begin to brown at the edges, but the center is still soft. 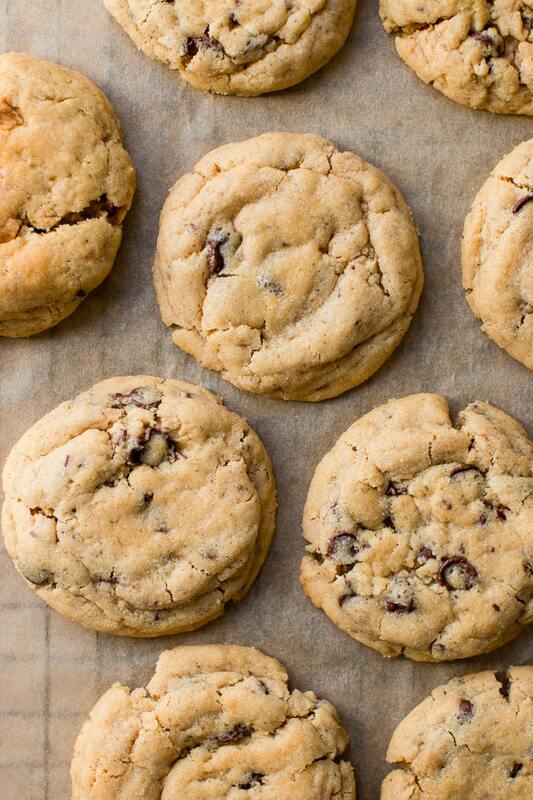 Cookies will appear undone, that's ok. If the cookies are puffy, gently press them down while still warm using a spatula or the back of a spoon but leave them thick. Allow cookies to cool for 10-15 in the cookie sheet until they are easy to transfer without breaking, then gently transfer them to a wire rack to cool completely. 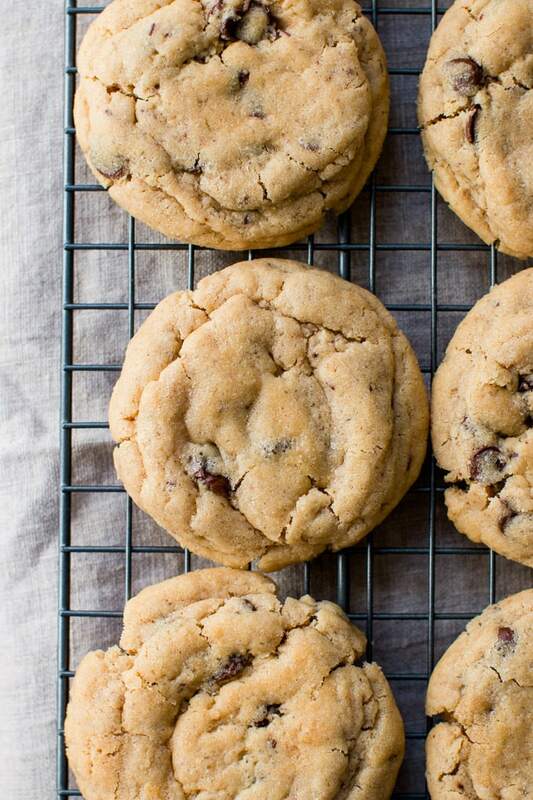 Serve cookies warm or at room temperature. Store cookies at room temperature in an airtight container for up to 3 days. 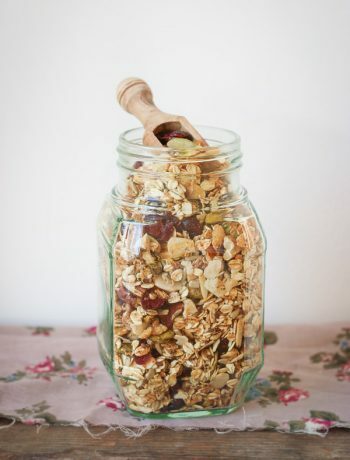 If you plan to keep them for longer, place in the fridge for up to 1 week, or freeze for up to 2 months. Shiran, if I use natural peanut butter because I don’t condone eating/using Skippy, can you tweak the recipe to compensate for the looseness of the natural stuff? Hi Nicki, natural peanut butter won’t work as well in this recipe. I haven’t tried it so I don’t know what adjustments will need to be made. These are a new family FAV!! We love them I’m making them almost once a month now! My boyfriend can’t get enough of them!! 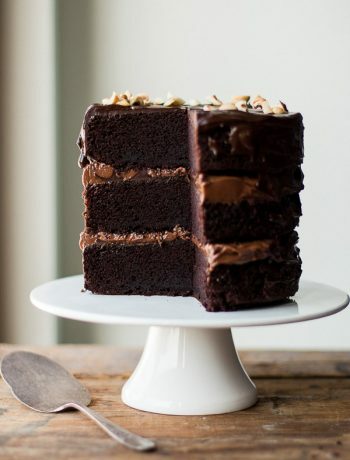 They are easy to make and incredibly delicious, I stumbled upon this recipe on IG and now I’m in love with you whole blog and all the tasty recipes! Hi! I’m all set to put these in the oven, but I don’t have a full hour to chill the dough. What can I do? Hi – I love your site! I’m wondering if this recipe might work with tahini? Thank you, Allison 🙂 You mean using tahini instead of the peanut butter? Personally, I don’t think it’s a good idea because of its flavor and texture. 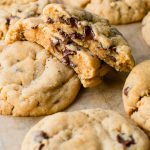 My favorite cookie recipe ever! I use a little less butter but other than that I follow the recipe exactly! I use milk chocolate chips in them. Anytime I make these for an event or bring them somewhere they are gone so quickly! They are soft and delicious. Thank you!